This memorial drinking fountain commemorates Greyfriars Bobby, a Skye terrier who reputedly watched over his master's grave in nearby Greyfriars kirkyard for fourteen years. Touched by Bobby's devotion, the kirk gardener erected a shelter over the grave for him, and Edinburgh's Lord Provost paid his licence fee to save him from being impounded and destroyed: "effectively, Bobby was now owned by the city" (McNab 307). The dog became so famous that shortly before he died William Brodie was commissioned to model this likeness of him. Photograph, caption and commentary by Jacqueline Banerjee, 2009. Benedict Read writes humorously: "How the sculptor kept his sitter occupied is not recorded, though the dog's patience was exemplary and renowned; whatever the case, the portrait is very natural" (177). Undoubtedly the most popular and beloved of all Brodie's many works, it was executed during the period when he was working on figures from Scott's Waverley novels to adorn the Scott Monument in Princes Street, Edinburgh. The bronze dog was integrated into this drinking fountain, and the whole was a gift to the city by the well-known philanthropist and animal-lover, Baroness Angela Burdett-Coutts, one of the many who had visited Edinburgh to see Greyfriars Bobby keeping his vigil (see "Prominent People"). The dog also inspired Eleanor Atkinson's well-known novel Greyfriars Bobby (1912), originally written for adults, but now considered a children's classic. 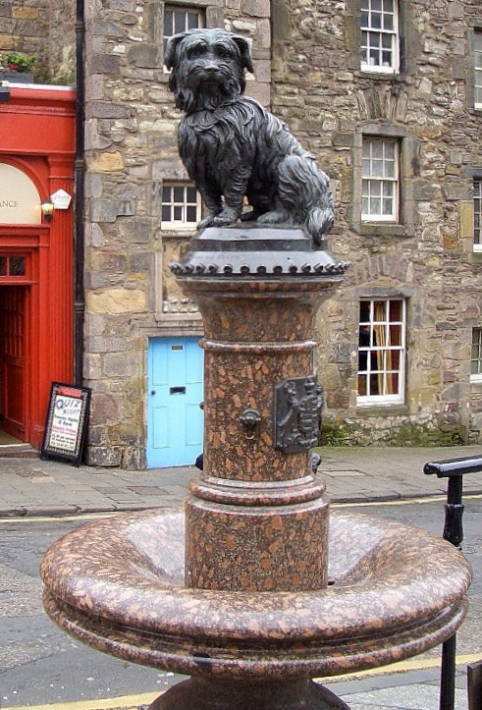 Greyfriars Bobby’s drinking fountain was unveiled without ceremony on Saturday 14th November 1873 almost two years after the little dog’s death. Following her unsuccessful application to set up a memorial to the owner of the dog on the spot where he was said to have been buried, Baroness Burdett-Coutts wrote to the city authorities again offering to provide the funding for a drinking fountain which could be used by animals and the public. William Brodie was commissioned to sculpt a life-size bronze statue of the terrier to sit on top. Supervised by David Cousin the city’s Superintendent of Works and the sculptor, a squad of workmen set up the pedestal at the junction of George IV Bridge and Candlemaker Row and connected it to the city’s water supply. The octagonal water trough now stands close to the ground due to the gradual raising of the pavement over the years. A cylindrical column of polished Westmoreland granite three feet high and twenty inches in diameter, finished at the top with a moulding stands in the centre of the trough, supporting a vase shaped drinking basin three feet in diameter. A bronze plaque bearing the inscription ‘A tribute to the affectionate fidelity of Greyfriars Bobby. In 1858 this faithful dog followed the remains of his master to Greyfriars Churchyard and lingered near the spot until his death in 1872. With permission erected by the Baroness Burdett-Coutts.’ is fixed to the front of the column. A second column twelve inches in diameter and eighteen inches high supporting the little dog’s statue, stands in the centre of the basin in line with the column at the base. Two bronze plaques, one bearing the arms of Baroness Burdett- Coutts and the other the arms of the City of Edinburgh are fixed to the column on either side of the spot where the water spout was positioned. The words ‘Greyfriars Bobby. From the life just before his death’ are inscribed around the base of the little dog’s statue. McNab, Christopher. Pocket History of Edinburgh. London: Lomond, 2008. "Prominent People in Bobby's Life and Story." Viewed 14 April 2009.